I experiment with coil-bound books to use them as journals. This one did not work out well; the pages seemed firm enough, but they did not take water media very well. It’s usually a trial and error kind of thing. This one will be tipped into another journal. 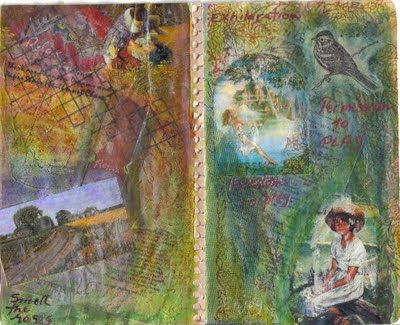 These pages started off with washes of Golden acrylics, followed by some rubber-stamping, then collaging of text papers and images, then more paints, including a favourite of mine – Portfolio Oil Pastels. Just building up textures. I really like the textures you've built! Nice. Ah, swinging way up high!. Beautiful page! Beautiful. I am new to altered books, etc. Your spreads are very beautiful and appeal to me. I like the colors and uplifting messages. I am not creative/artistic but I enjoy good art and am a bit jealous of your talent!